And all of a sudden you find yourself looking at something beautiful. I was late for lunch at Beluga and left my friend in Woodstock thinking I knew exactly where I needed to go. I took the wrong road and found myself in the middle of the centre of town’s taxi rank. A place where everyone drives a VW minibus, so my Toyota was a bit out of place and I was obviously not au fait with these rather unique road rules – i.e. drive wherever and whenever you find a gap. After turning around and having the guts to just drive I was headed back in the right direction when I looked to my left and saw the most gorgeous view of Table Mountain. It reminded me of the saying to “stop and smell the flowers”, that is something I need to remember more often I must take time out and appreciate the beauty that surrounds me. Cape Town you rock (pun intended)! 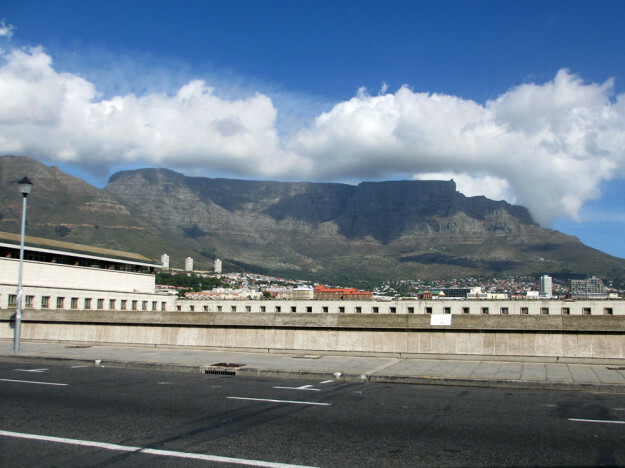 This entry was posted in Play and tagged cape town, fun.